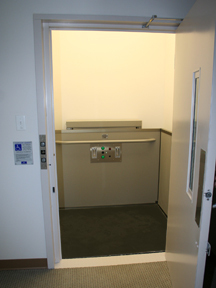 The Genesis Shaftway Model vertical platform lift is equipped with many standard features. Some of these features are listed below. For a more extensive list of features contact your local Garaventa Lift Representative or refer to the Genesis Design and Planning Guide . The frame is constructed of champagne colored anodized aluminum extrusions. The standard configuration for this model of lifts is a full size Garaventa Lift style door at the lower landing. The upper landing may be fitted with a gate or full height door. The offset d handle is available on both Garaventa Lift style doors and gates. The Garaventa Lift Powered Interlock is the standard lock used for Shaftway models that are equipped with Garaventa Lift style doors and gates. The Powered Interlock is a 24VDC solenoid powered interlock that is monitored by the safety circuit to ensure the door or gate is properly locked. Seven different lifting heights to a maximum of 4343mm (171"). Consist of a directional rocker switch and is key-less. Consist of a constant pressure directional rocker switch, an emergency stop/alarm switch and optional key switch. The standard finish is anodized champagne aluminum frames, with steel panels that are powder painted in Satin Grey (fine textured). A hand wheel is attached to the lift and is used to manually lower the lift to the landing in the case of a power outage. The manual emergency lowering device consists of a pull knob mounted in a box on the side of the mast. When this device is used, the platform is lowered to the desired landing.